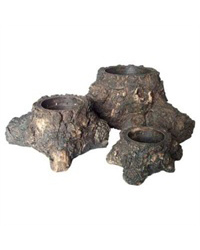 Tree Planter are made of resin and look like a natural tree trunk with an opening to add a plant. An excellent product to add live plants to your terrarium without destroying its natural looks with plastic or clay pots. "The frog and the substrate arrived very quickly. Your service is AMAZING! The BEST online reptile store! I will be buying from you in the future and telling my friends about you."